When the roundhouse roof fell onto B&O 20, one of the Morris journal boxes was shattered beyond repair. The cast iron Morris box has a spring steel lid that pivots around a bolt at one end and forms a good seal against dirt and rain. The trucks for CP 29 are nearing completion so we are searching in earnest for a replacement journal box. The author recently visited the Roaring Camp Railroads in Felton, CA, in search of a Morris box. He found three in their parts collection, BUT the boxes are for arch bar trucks instead of passenger trucks. So the search continues. The south end wall was burned by a 1970's stove pipe flashover fire that occurred within the wall. Local firefighters had to cut open the outside wall. The damaged area was covered with a piece of plywood. 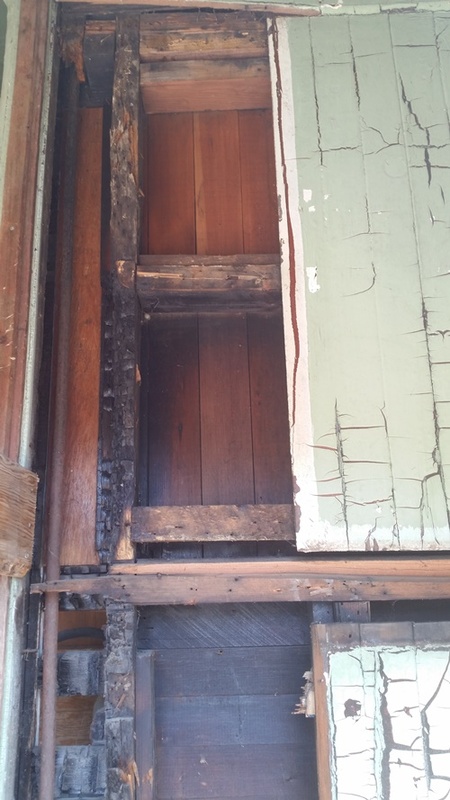 At the time of the fire, inside the car the original wainscot boards had already been replaced with narrow tongue and groove boards. Some of these narrow boards were burned through. 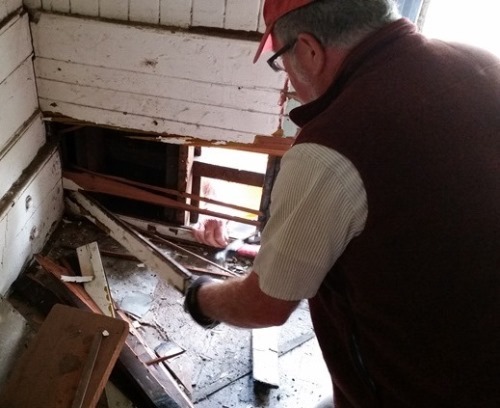 Dave Dietz and the author removed the plywood and the small boards to evaluate the structural condition of the wall. While the window posts appear to be usable the end beam of the car has some rot below the door. After this area is repaired the missing boards will be replaced with pieces of the correct profiles. The Restoration Team disassembled the WABCO brake cylinder salvaged from B&O 20 and found it to be in usable condition. The brake cylinder's various cast iron components were taken to a local machine shop where they were baked at 700⚬ then blasted with steel shot. After a wipe down with lacquer thinner the parts were painted black. A new packing ring was installed on the piston to seal its rim inside the cylinder. The cylinder interior was coated with a special grease, then the piston and packing ring were inserted, and the cylinder pressure head was bolted onto the cylinder. The release spring and non-pressure head were placed over the piston rod, the non-pressure head was pushed down to compress the spring, and the cross-head was riveted onto the piston rod, thereby locking the assembly together. At that point the non-pressure head could be bolted to the cylinder. We are still in need of a conductor's valve and pressure gauge. If you can donate these items, please contact the author at mike_mnsn@yahoo.com. CP 29 needs donations to our "Buy a Pound of Pedestal" campaign. Each donation of $10 will cover the prorated cost of the patterns, steel, sales tax, energy and labor needed to cast one pound of a pedestal for CP 29 and bring it to the De Carli Trolley Museum. Please send your donation today. This is one of the good boxes. Note the vertical bars, which allow the box to slide up and down inside the pedestal jaw. Photo 2: Here are a couple of the Morris freight car boxes, at Roaring Camp & Big Trees Narrow Gauge Railroad in Felton, CA. The lids are the same, but the box is designed to be rigidly bolted into the arch bar truck frame. These are not what we need. The southeast end wall shows its fire damage. The exterior boards were pulled off by the local fire department. The lower horizontal boards will also be replaced as they are not original to the car interior. CP 29 originally had end wall windows, one on either side of each door. These were blocked off before the car arrived on the NWP in 1912. This window opening was partially exposed by the fire fighters. 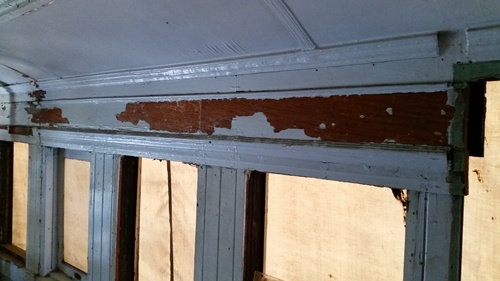 The original window sill separates the upper and lower exterior boards. Dave Dietz is making short work of the burned wainscoting. These boards are not original to the car and don't match the other paneling. The south end wall will be repaneled with boards that match the original profiles at the north end. The brake piston with its new and old packing ring, along with the cylinder non-pressure head (left) and cylinder pressure head. 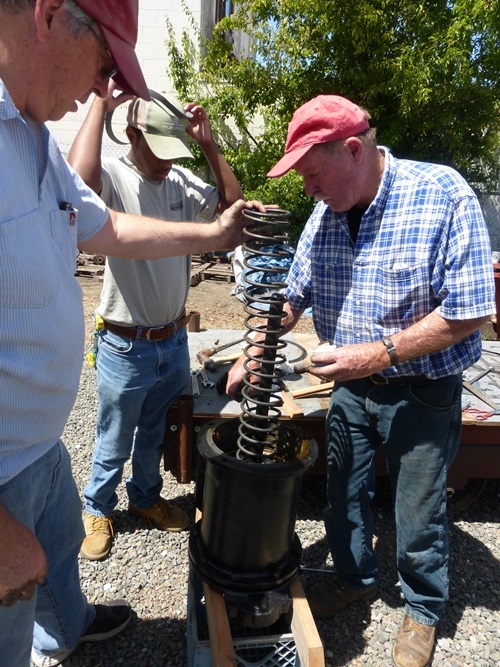 The author, Jelani Hall and Jeff Millerick are installing the release spring on the piston rod, to be followed by compressing the spring and bolting the non-pressure head onto the brake cylinder. This photo is by Steve Atnip; all other photos are by the author. Almost complete: The reassembled brake cylinder still needs the bolts for the non-pressure head. Now that P&SR Caboose 1 is completed, and work is progressing on NWP Baggage 605, CP 29 must be made ready for restoration work to proceed. 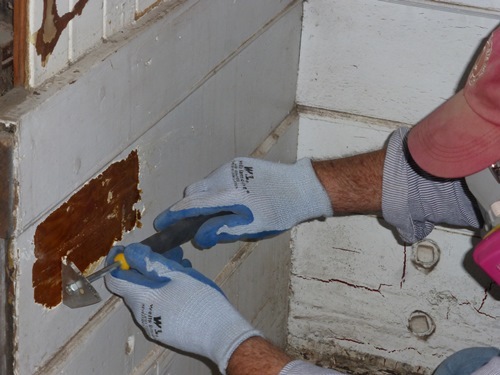 A general cleanup of CP 29's interior was done during the last couple of months. "Stuff" had accumulated in the car since its arrival in Petaluma: several wooden chairs, a small desk, lots of nuts and bolts, four storage shelves and tools. The car had also served as a storage facility for Baggage 605's wood siding purchased with funds from the Buy-A-Board Campaign. But now the siding is where it belongs, hanging on the exterior wall of the baggage car. Back in April 2012 the Society was offered 188 board feet of 1¼" pattern-grade mahogany planks. We purchased them for use in the restoration of CP 29. These planks had been kept inside the car since then. 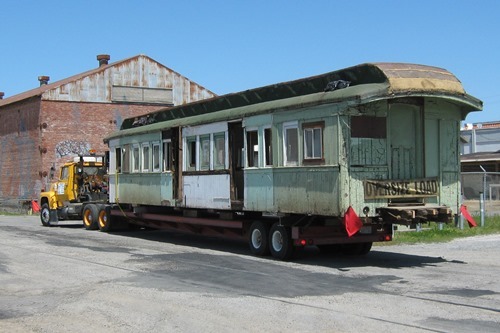 At the beginning of August, they were moved into the yellow barn at the De Carli Trolley Museum. 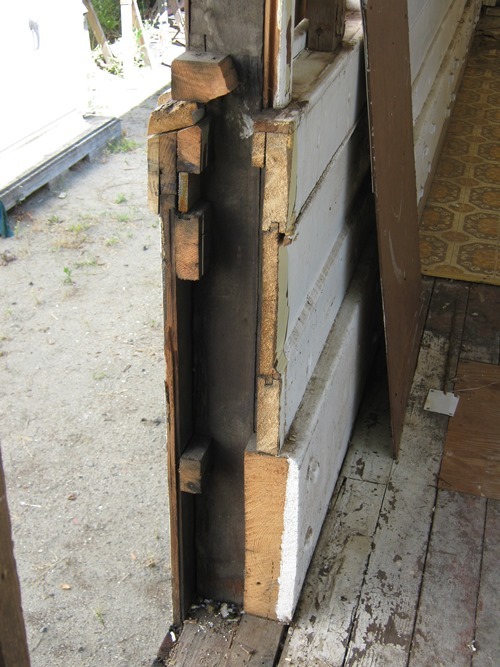 With the siding and the mahogany planks out of the car, and the remaining materials organized the Restoration Team will have better access around the car's interior. Some of the interior paint is flaking off the underlying varnished wood. Scraping the paint with a knife has sped up the process on one of the planks above the windows, but the Speed Heater lamp will be used for most of the work. The west side of the car must be repaired where two doorways were cut into the wall. At each doorway the truss plank and the inverted body truss rod were cut out. The inverted body truss rod extends horizontally along the side wall beneath the windows, from one corner post to the other. It dips down at the ends to support the car floor. A truss plank is a 3"x12" beam that is located inside the car at the base of each side wall; it too extends from corner post to corner post. The truss planks are set on edge onto floor boards that in turn are set upon the side sills. The truss planks are bolted horizontally to the window posts and vertically to the side sill. Beneath CP 29 the two truss rods and their supporting queen posts were cut away when the car was detrucked. The truss rods extended beneath the car from end to end, pushing up against the queen posts, which pushed in turn upward against the needle beams. The needle beams pushed upward against the car floor assembly. CP 29 as it sits on support beams is not level. A preliminary survey indicates that the car's south end is two inches lower than its north end. Whether the dropped end is due to damaged truss rods or a difference in elevation of the support beams is not yet known. To eliminate the potential for creating a permanent distortion in the car when the damaged areas are repaired, CP 29 will be leveled using screw jacks at several locations on both sides of the car floor. The jacks will be set at both ends, the mid-point of the car, and beneath the cut-out areas. Once the car is leveled the inverted truss rod will be welded and the spring plank repaired. Eventually the queen posts obtained from B&O 20 will be bolted to the needle beams, and 20's truss rods will be welded into position under 29. 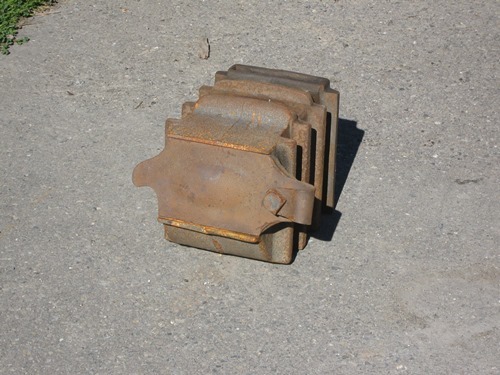 The Restoration Team is planning to install a steel channel beam to connect the two coupler pockets and support the car floor, just as we did with Caboose 1. The combination of truss rods, inverted truss rods and steel channel beam should keep CP 29 as straight as the day it left the Wason factory. 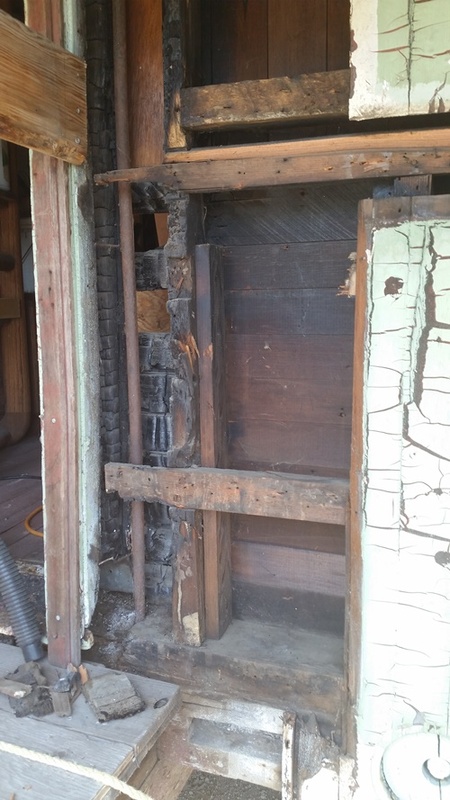 After the car is leveled the interior paneling will be removed from the west wall to repair the inverted truss rod and spring plank and replace the missing window posts. New planer blades will be cut to match the existing board profiles, then some of the mahogany planks will be milled to replace missing or damaged trim boards. 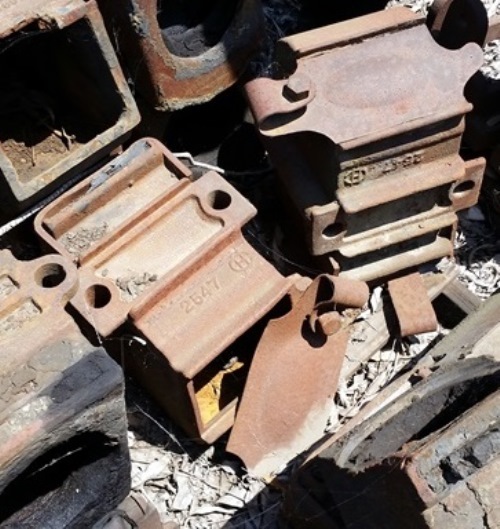 We are still looking for a passenger car version of a Morris journal box to replace the box destroyed in the roundhouse disaster in Baltimore. Also, a conductor's valve and pressure gauge are needed. If you can locate or donate these items, please contact the author at mike_mnsn@yahoo.com. CP 29 needs donations to our "Buy a Pound of Pedestal" campaign. Each donation of $10 will cover the prorated cost of the patterns, steel, sales tax, energy and labor needed to cast one pound of a pedestal for CP 29 and bring it to the De Carli Trolley Museum. One donation of $30 came in this last month, so three more pounds of pedestal have been funded. Please send your donation today. Photo 1: CP 29 arrives at the De Carli Trolley Museum in May 2010. The wall damaged by cutting the two doorways into the side of the car must be repaired. The car end in this photo was damaged by a fire described in the last Headlight. All photos are by the author. Photo 2: Some of the paint can be scraped off the underlying varnished wood. One of the door openings is visible at the right side of the photo. All boards in this photo will be removed to make repairs. The 3"x12" beam at the base of the wall is a spring plank that is part of the car's suspension system. The spring plank was cut out at two locations along the west wall. Also cut was the inverted truss rod, a narrow band of steel that extends along the outer wall from one end to the other just below the windows. It supports the ends of the car. CP 29 needs another Morris journal box like this one. Note the vertical bars, which allow the box to slide up and down inside the pedestal jaw of a passenger car truck. The freight car version is bolted into the truck. Work continues on several items. 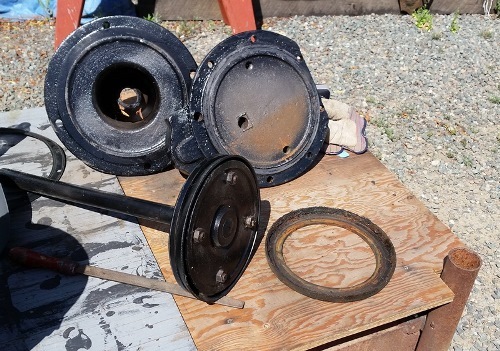 The Westinghouse Air Brake Company's (WABCO) auxiliary reservoir and the four Wason queen posts went to a sandblasting shop for cleanup. When they were returned to Jeff and Don Millerick's shop the tank and posts each received two coats of black enamel paint. 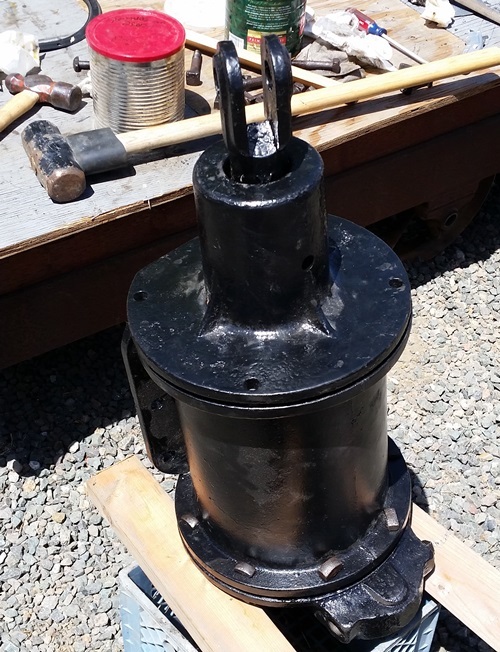 The triple valve that was sent to Pittsburg for rebuilding, was returned without repairs having been made. The shop was not able to find the necessary parts. We have a lead on another shop in Ontario, east of Los Angeles. 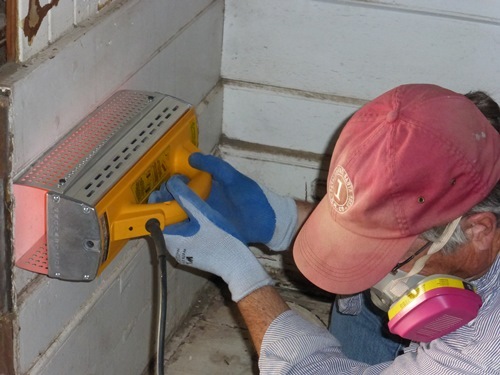 The author is using the Speed Heater infrared lamp to remove the old paint from the end wall in the northeast corner of the car. The 1100-watt lamp softens paint in less than 40 seconds, allowing the paint to be scraped away and leaving nearly bare wood. The original coach interior wall boards below the windows were finished with a clear coating, while the end wall base boards and 3"x12" plank trusses at the base of the side walls were finished with an unexpected red coating. 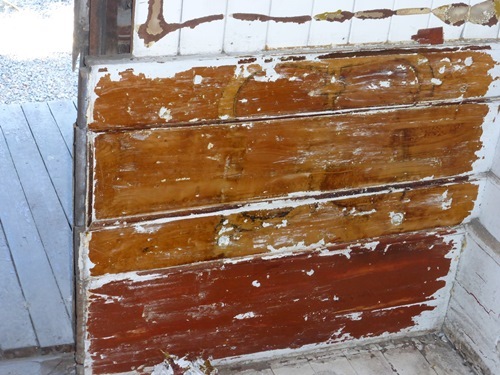 Whether the red coloring is stain or paint is not yet known because the material scraped off the walls is mixed together. However, the bottom-most layer is only partially removed and requires additional work. Some testing was done using lacquer thinner and denatured alcohol to identify the original finishes, but the results were inconclusive. Additional testing will be done soon. 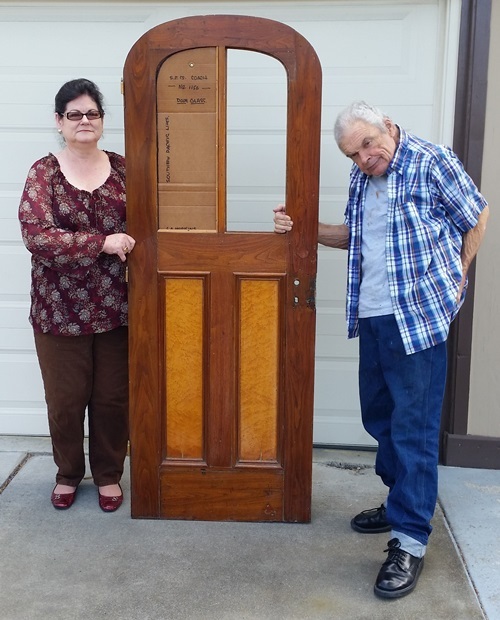 Charles and Dolores Hopkins of Santa Clara donated a wooden car door that had been salvaged many years ago from a MOW car at the Southern Pacific's station at Radum, Alameda County. The detrucked car was used as an office and was slated for demolition when the door was rescued. The design and style of the door are identical to those of CP 29, indicating that the car was probably built by the Wason Manufacturing Company, too. 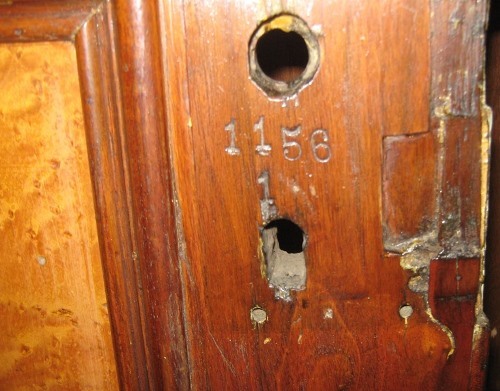 Beneath the (missing) interior door latch the following numbers were stamped into the wood: "1156" and "1". The "1156" identifies the car as CP 1156, while the "1" identifies it as Door #1. Central Pacific records now at the California State Railroad Museum show wooden coach 1156 was built by Wason and placed in service in September 1869. We have not yet located the original number for this car but will continue searching. We still need donations to CP 29's "Buy a Pound of Pedestal" campaign. Each donation of $10 will cover the prorated cost of the patterns, steel, sales tax, energy and labor needed to cast one pound of a pedestal for CP 29 and bring it to the De Carli Trolley Museum. As of September 30, we have accumulated $1,770 for the campaign. That is 12% of our goal. Every dollar helps, so please send your tax-deductible donation today. Photo 1: The author keeps an eye on the time while using the Speed Heater. Forty seconds of heating softens the paint and varnish. This photo and the next two are by Steve Atnip. Photo 2: Scraping down to the 146-year-old factory finish. The paint does not become hot enough to vaporize the lead pigment. Photo 3: Removing all the paint revealed the oxidized outline of a seat end that had been fastened to the car's end wall. The seat probably was installed while the car was in East Bay Commute Service. The lowest wall board is either stained or painted a deep red color. Photo 4: Dolores and Charles Hopkins donated a door from CP 1156, which is listed in CP records as having been built by the Wason Manufacturing Company in 1869. The car's original number has not yet been identified. This photo and the next are by the author. Photo 5: The numbers "1156" and "1" indicate this was Door #1 of CP 1156. This area was originally covered by a large brass latch.